After Return of the King came out in theatres, I decided to express my geeky worship of all things fantasy by knitting a scarf with Elvish on the bottom. I opened my copy of the trilogy and, square by square, tried to translate the writing onto paper. After an hour of wasted time and a forest of wasted graph paper, I realized that Photoshop 7 could do exactly what I wanted in minutes. The possibilities are endless: your favorite band's logo, your niece's favorite cartoon character, even the face of the latest teenage heartthrob (for those with a million colors of yarn and a million hours of free time). This tutorial assumes you are familiar with the basics of Photoshop, but the technique can also be used with Paint Shop Pro. 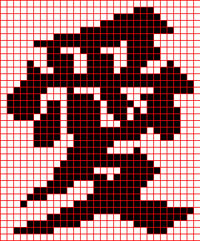 1) Find and open the image you want to knit. You can use google or other search engines. Pictures with few colors (usually gif files) work best. You also probably want an image that is not very detailed. In this example, I used the Chinese word for love. 2) Crop the image so that there is very little border. 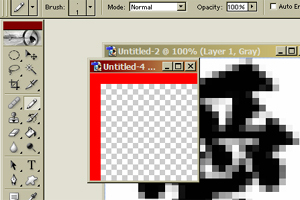 3) Resize the image (Image>>Image size) so that its width in pixels is 10 times the width in number of stitches. I wanted the final product to be 30 stitches wide so I made the image 300 pixels wide. Make sure you remember to constrain proportions. 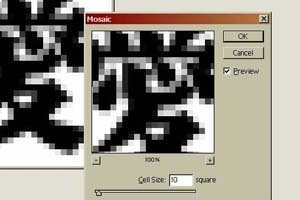 4) Then, apply the mosaic filter ( Filter>>pixelate>>mosaic). You want a cell size of 10. 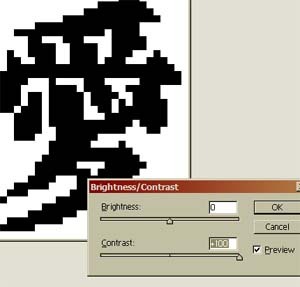 5) Reduce the number of colors by adjusting the contrast (Image>>Adjustments>>Brightness/Contrast). I only wanted to use two colors so I set the contrast to +100. 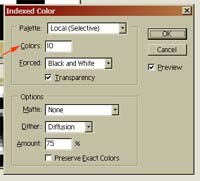 If you want to control the number of colors in the image, you can save the image as a gif file and choose the number of colors. 6) Next, make a grid to separate the stitches. First open a new image that measures 10 pixels by 10 pixels. Draw two lines with the pencil tool as shown (zoom in as needed). Choose a color that can be seen well. 7) Select All (Ctrl + A) of the new 10 by 10 image. Define your pattern using a name you will remember (Edit>>Define pattern). 8) Return to the image you are making into a chart. 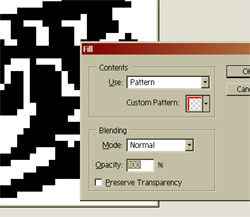 Make a new layer and fill that layer with the pattern (Edit>>Fill). 9) You're done! Save the final image as a gif file and print it out or work directly off your computer. Happy knitting. Tina Yeung is a high school senior in California. She uses the time that could be devoted to school for better things, like knitting and making her Halloween costume.